The terms “genocide” and “ethnic cleansing” were both coined in the 20th century to describe the attempted extermination of a specific group of people by their own government. Genocide was first used in 1944 in regard to the Holocaust, and ethnic cleansing was first used in the early 1990s to describe the policies of Bosnian Serb militias against Muslim civilians after the breakup of Yugoslavia. But the concepts and the practices have been in use for much longer. 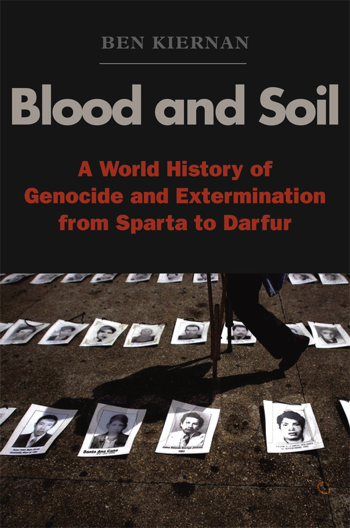 Blood and Soil is a ground-breaking global history that reveals connections between the various ideologies, psychologies and personalities that have propelled the major human-directed disasters of modern history. This understanding is crucial if we are to go beyond description to prevention. In Blood and Soil, Ben Kiernan makes an urgent case for understanding the past as the best means to recognize and avoid genocide in the future. The German edition, Erde und Blut: Völkermord und Vernichtung von der Antike bis heute, won first place in Süddeutsche Zeitung and NDR Kultur’s Nonfiction Book of the Month Prize in June 2009. Ben Kiernan has provided the most extensive history of our genocidal propensities that I have ever read. He starts his history early, with Roman and Greek massacres of barbarians, and works through the Spanish conquest of the Americas, the exterminating vigor of American settlers toward Indians, the Turkish way with the Armenians, the German way with the Jews, Stalin’s way with the Ukrainians, the Khmer Rouge’s way with the Cambodians, the Serbs’ way with the Muslims, the Hutus’ way with the Tutsis, and the Sudanese way with the Darfurians. If you want to know how it was done, where and when it was done, and how many victims there were, Kiernan has the answers. This is a formidable and important book. Covering instances of genocide on every continent . . . Kiernan notes haunting continuities across cultures and time periods. . . . A bold and substantial work of unprecedented scope, this book is international history at its best. Ben Kiernan’s Blood and Soil, a meticulous new study of this most slippery of criminal categories . . . highlights the contrast between our conventional and our legalistic definition of genocide by choosing case studies that, with few exceptions, attain the highest standard of vileness.